The entire process is menu driven. The title columns can be any columns you wish. the data columns can be all columns to the right of the title columns, or any set of columns you select. 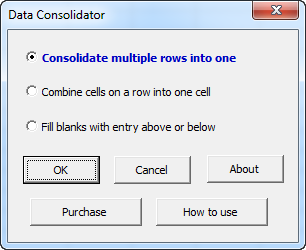 The second option on the Data Consolidator, Combine cells on a row into one cell, will concatenate or combine cells into one cell. For example, in the above example, the first and last names, which are in separate cells, can be combined into one. Or the scores, which are in separate columns, can be combine into one cell. One can use a space as a separator, use no separator, or specify any text one wants to separate the combined entries. One can select multiple rows and multiple columns for combining.